KS-68PS Senior Care Alarm with Strobe is simple and can be used for retirement communities, hospital, and family homes. 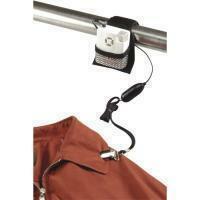 The alarm can be clipped onto the person's clothing for continuous monitoring of fall management. If the patient or senior person falls, the magnet switch on the clip will separate and activate the alarm. The alarm contains a deactivator after the alarm is triggered. This replaces the need of an on/off switch and eliminates the risk of forgetting to turn it on.